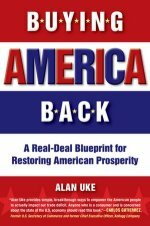 Buying America Back- a must read! We have added another book to our vast library, which consists of 2 books now! Alan Uke is a Made in USA advocate, business owner and now author. While BAB covers some familiar ground, it also brings forth two new concepts which were unfamiliar even to us. The COOL or Country Of Origin Label and a countries TRADE RATIO with the USA. We all know that buying a product with a "Made in USA" label does wonders for the US economy. However, these new and very simple ideas could also add substantially to our countries prosperity. For example, did you know that buying a product Made in Taiwan (while not recommended in general) is much better for America than one bearing a Made in China label? That's trade ratio. And obviously its better to buy a product with 5% USA content than one with none at all. Thats COOL. Read the book to find out more.